As AT&T steps up the pace with its rollout of their GigaPower 1 Gbps Internet service across the country, another giant service provider — Comcast — is dipping their toes into this highest tier of consumer-level broadband. Atlanta is slated to be the first city for Comcast’s new “One Gig” service, with a catchy brand name apparently to be named later. There’s no doubt the status of Atlanta as a Google Fiber city also played into Comcast’s choice of the city for its own offering. Are you a local resident curious about whether or not Comcast’s Internet service makes sense for you? Read on for more details. Comcast’s new service tier will be available for customers at a price of $70 per month, essentially matching the going rate for GigaPower and Google Fiber. But customers only get that price by agreeing to a three year contract with an up to $350 early termination fee. The contract-free monthly rate is $139 and comes with a 300 GB data cap. Needless to say, the presence of a data cap on a gigabit Internet service is already earning Comcast ridicule among technology pundits. Comcast also offers a cap-free and contract-free option for $174 per month. Interested Atlanta residents need to agree to the contract for the most cost savings or simply wait for Google Fiber and/or GigaPower to become available at their location. For the customers’ sake, here’s hoping additional competition forces Comcast to do away with an obsolete data cap policy, especially when considering 1 Gbps Internet speeds. The company has said it will offer more pricing options as the service expands its footprint across the country. 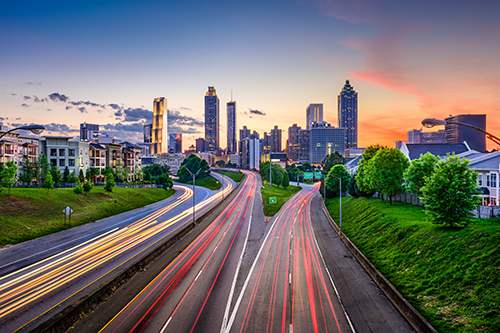 Comcast considers Atlanta to be essentially a test rollout of its new 1 Gbps service. After the Georgia city, the company plans on expanding its offering first to Nashville; followed by Chicago, Detroit and Miami. Not surprisingly, most of those cities are also targeted by Google and AT&T for their own Internet offerings. The technology behind Comcast’s gigabit service is called DOCSIS 3.1. The major advantage of this framework is that it allows for 1 Gbps speeds over existing network infrastructure. This could be a big plus for the technology giant in its battle for customers with AT&T, Google, and other smaller providers. DOCSIS 3.1 limits upload speeds to around 35 Mbps, while fiber generally works at gigabit speeds in both directions. This is a point worth considering if a customer regularly hosts their own 4K video streams. With Comcast’s entry into the gigabit Internet service fray, expect competition to get fierce. In fact, one of the reasons for Comcast’s contract-based pricing structure is to gain captive customers while AT&T and Google are still putting fiber in the ground. Stay tuned!